The QBrand QBlog: Whose brains fell in the blender at Boost Juice? Whose brains fell in the blender at Boost Juice? But Boost has been conspicuously unsuccessful thus far in its attempts to leverage its massive brand equity from the fresh juice service sector by way of brand extensions into the very different world of fast-moving consumer goods (FMCG). Two different attempts so far at bottled juice haven't exactly set the world on fire (see picture). Now you can find a thing called a Boost Smoothie on a Stick in the ice-cream freezer at the supermarket (it's actually fruit ice around frozen yoghurt, but let's call it ice-cream for the sake of simplicity). I bought a pack of Smoothie On A Stick as soon as I saw it last week, because frankly I don't think it'll be around for long - at least not based on the present marketing program. In my view, Boost is making a number of critical mistakes, and these can be illustrated quite simply. First, consider the Boost Juice brand. It instantly conjures up associations of custom-made and personalised (they even call out your name), premium fresh juice products at premium (some might say "exorbitant") prices, for which consumers are willing to sacrifice several minutes of their time waiting (perhaps partially compensated by the "scene" in the average Boost bar). Prices typically start at $4.00 and head upwards of $6.00 once you add some fancy supplements (often of dubious nutritional value, but that's a topic for another blog entry). Boost re-invented fruit juice and gave it enormous street cred. Ask most Australians aged 12 to 25 to describe juice and Boost or a Boost-style offer will likely be what they call to mind. Now compare the Boost Smoothie On A Stick brand extension. The actual end product is a small ice confection, of stock-standard shape (looks like they use the same mould as any regular icy pole) on a stock-standard "icy-pole" stick - hardly re-inventing the category. Of course, they aren't sold singly - they come in a pack of 8, and they sit in the supermarket right alongside other boxed multi-pack ice-creams like the Streets Pine-Lime Splice (also 8 to a pack). In fact, functionally, the Pine-Lime Splice would seem to be Boost's closest rival in this category. Bulla (whose Regal Cream affiliate is actually listed as the manufacturer of the Boost products under licence) also does strawberry and mango Smoothie Splits. A multi-pack of 8 doesn't exactly say "premium" either, does it? Typically, when a super-premium ice-cream brand (e.g. Magnum or Heaven) does a multi-pack, they put only 4 in a pack or, as special "mini" versions, 6 to a pack. So if the product doesn't communicate a top of the market positioning, then price must be how Boost signals "premium", right? Wrong! 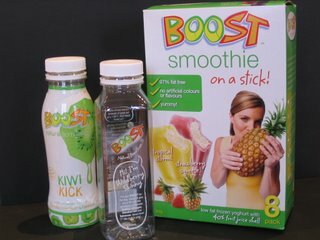 My 8-pack of Boost Smoothie On A Stick (600 mL) cost $3.99 at Coles (regular price, not apparently on special). An 8-pack of Streets Pine-Lime Splice (584 mL), bought in the same supermarket at the same time, cost $4.99. And the ice confection itself? Pleasant enough, but nothing special in terms of flavour or texture, I'm afraid. So what the heck is Boost Juice doing taking an immensely valuable brand that commands a massive brand premium down-market by entering a commodity category with a "common as muck" product and at a price well below that of an FMCG powerhouse like Unliver/Streets? Destroying brand equity, that's what! Boost franchisees should take note... and start asking some serious questions.